The increasing economic growth and changing consumption trends world wide have resulted in a significant rise in the disposable incomes and consumers’ propensity to spend. The advancement in technology and changing lifestyle, status or perception of consumers has driven this demand of electronic items. Consumers’ dependency on information and communication technology has been increasing very rapidly. The new innovations in information technology because of the rising demand for higher efficiency and productivity in the businesses and work have become a matter of day to day life. Technologies which were new yesterday have become obsolete for today. The increase in demand for “White Goods segment” i.e. on consumer durables such as television sets, microwave ovens, calculators, air-conditioners, servers, printers, scanners, cellular phones, computers etc. is for obvious. Thus, there can be broad range of waste electric and electronic goods which have outlived their use, ready for disposal. These contain chemical materials considered hazardous for human well beings and natural environment.The increasing rate of waste electronic products and additionally the illegal import of junk electronics from abroad create a complex scenario for solid waste management in India. According to Ministry of environment and forest, E-waste is such waste comprises of wastes generated from used electronic devices and household appliances which are not fit for their original intended use and are destined for recovery, recycling or disposal. The Indian electronic waste industry is booming at a very rapid pace. It is expected to be increasing at a rate of 20% annually. With increasing per capita income, changing life styles and revolutions in information and communication technologies, India is the second largest electronic waste generator in Asia. India is generating around 4, 00,000 tones of electronic waste per year according to Ministry of Environment and Forest MoEF. Not only this, it gets around 50,000 tones of e waste through illegal means of imports. According to a report on electronics market, TATA Strategic Management Group says that India is expected to have 11% share in global electronic market. MoEF’2012 report says that Indian electronic waste output has jumped 8 times in the last seven years i.e. 8, 00,000 tones now. India has majorly two types of electronic waste market called organized and unorganized market. 90% of the electronic waste generation in the country lands up in the unorganized market. And out of this only 5.7 % of e waste is recycled. Electronic waste accounts for 70% of the overall toxic wastes which are currently found in landfills which is posing toxic chemical contamination in soil and other natural resources. Another report from Central Pollution Control Board CPCB says that around 36,165 hazardous waste generating industries in India accounts for 6.2 million tones of toxic wastes every year. Indian PC industry is growing at a rate of 25% annually as per MAIT study. Out of the total electronic waste generation in India, only 40 % of these are taken into the recycling processes and rest 60% remains in warehouses due to inefficient and poor collection systems. Generally, people hand over electronic waste to unauthorized recycling centres/ scrap dealers etc. for quick money. The e-waste scrap is managed through various management alternatives such as reuse of equipment from second hand dealers, back yard recycling (manual dismantling and segregation into plastic, glass and metal) and finally into the municipal dumping yard. MAIT (Manufacturers Association for Information Technology) study says that waste from discarded electronics will rise dramatically in the developing world within a decade, with computer waste in India alone to grow by 500 per cent from 2007 levels by 2020. Over 100,000 tonnes from refrigerators, 275,000 tonnes from TVs, 56,300 tonnes from personal computers, 4,700 tonnes from printers and 1,700 tonnes from mobile phone. The electronic waste due to Computer waste also called techno trash is becoming most significant of all e-waste due to the quantity as well as the fast generation rate. The computer hardware sector has displayed an unusual growth in the past few years maintaining pace with the rapid growth in the software sector. The continuous innovations and technological up gradations in the hardware segment, obsolescence risk remains a key area of concern for companies that have made huge investments in their IT systems. 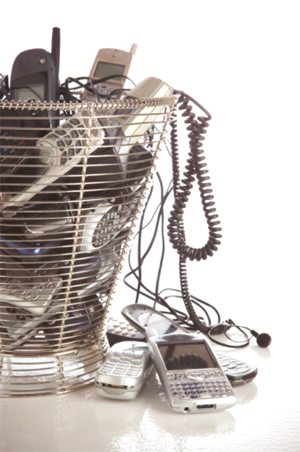 Managing Electronic waste has become a very big challenge. The governments and private organisation will have to play a crucial and responsible role in order to properly manage electronic waste. Proper inventorisation and management has been very necessary in order to reduce the negative impacts of e waste in human livelihood and maintain prosperity in society. It could be made possible through the consultation with different E-waste experts and the assessment of unorganised small scale industrial houses. Different awareness programmes and reach to the local level unorganised sector recyclers can play a pivotal role in efficiently managing e waste.